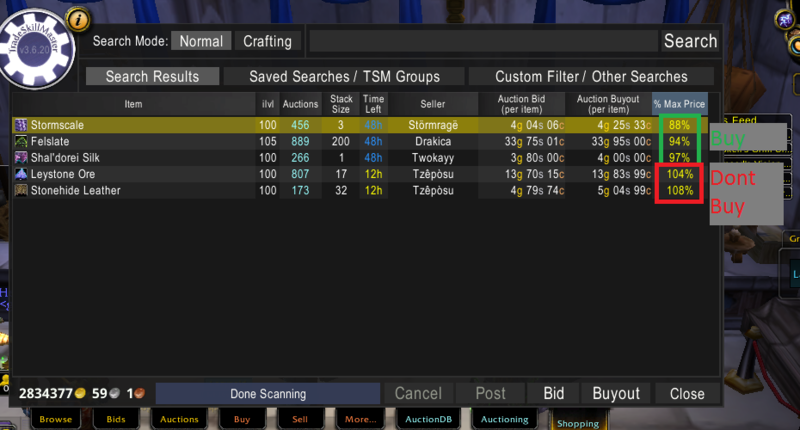 Flipping Legion materials is a very profitable market and it is very simple to get into. I have written about this before on a general level. Today I will go into the various material types. This will help you focus on the best opportunities and maximize your rewards. Gumdrops (The mod of reddit.com/r/woweconomy) recently started a weekly wow gold series on wowhead.com. Check out his latest post for info on shuffling, market analysis, transmog and a feature of my gold making challenge. If you don’t know what flipping is, I’ll refer you to my earlier posts on the subject. Go read those first and then come back! I have flipped a lot of herbs and some Gem Chips throughout my zero to one million challenge. Some of my resale summaries can be found below. You can see that my profit margin has been very high from 25-100%. When flipping you are buying low and selling high. When flipping materials you are acting as an intermediary between farmers and crafters. Demand for a lot of end items is highly variable over time. This also holds through for crafting mats. People who craft a lot (like me) will buy tons of stuff from the AH in one go. I can have sessions where I drop 500 000 gold or more in 15 minutes. One very important thing to note is that flipping can be risky. If you buy the wrong amount at the wrong price you can lose gold. Look at the current AH situation and see if you can realistically resell the items quickly or not. If there are a ton of 200 stacks at 99%dbmarket you might want to wait for the situation to change or adjust your max buying price down. Farmers just want to get their gold usually. Crafters will prefer neatly stacked items at decent prices. When flipping Legion materials your goal is not to sell items above market price, but to buy them below. Selling in stacks of 200 is usually best. You can find my TSM settings in my pastebin. They are generalized for all Legion materials to buy below 80% dbmarket and sell in stacks of 200 at 100% dbmarket. The group linked contains all Legion materials and applies the same settings to all of them. It will only undercut other stacks of 200. You will probably want to fiddle with the settings once you start testing it out. There is a lot of gold to be made if you can find a farmer and buy directly without the AH in between. Large farmers will usually be willing to sell their mats below market if they can be sure you will buy it. Advertise in trade with messages like this: “WTB Felslate, any amount 30g I buy large amounts every day!”. It can be a great competitive advantage both for flipping and crafting. Which materials are best to flip? I am only talking about Legion materials here. Herbs gem chips and food and fish are the top three because they are primarily used to craft consumables. This is great as it ensures high demand. Enchanting materials are also used for consumables, but the materials are primarily created by mass crafting so supply is generally too even for flipping on my realm. It could be different for you. I find that leather and cloth are currently the least attractive ones on my realm, but all of the materials on the list can be good. You can see my resales for gem chips and Herbs since I reinstalled WoW below. Herbs are awesome to flip. Demand is highly variable, and it’s fairly predictable throughout the week. Potion and flask demand peaks on raid reset day. Herb prices will generally fall throughout the week and hit bottom during the weekend. Then go back up slightly around Tuesday/Wednesday. There’s also a lot of gold to be made from turning smaller stacks into stacks of 200. The small stacks are usually cheaper and you can often get away with posting stacks of 200 at 110% dbmarket. Start with the basic herbs and then experiment with Felwort and Starlight using manual posting, as they are not used in the same amounts. Buy everything below 80% dbmarket and sell in 200 stacks at 100-110% dbmarket and you will most likely make gold. You can get away with buying herbs at higher prices, as demand will usually spike the price above DBmarket during the week. Gem Chips are a byproduct of prospecting. This means that supply is very spiky. If someone just prospected a large batch there will be a lot on the AH. People usually don’t value this so good deals can be found. They are only used in one recipe for food. The recipe takes 20, so people will need a lot of these when crafting food. This means that Gem Chips are perfect to flip with the exact same settings you use for herbs. My generic operation will work well for flipping gem chips. Food and Fish materials are used in cooking recipes, just like Gem Chips. Demand varies between the items based on what recipes they are used in. The food recipes usually take 5 of each so you can usually sell large volumes without problem. Fatty Bearsteaks, Highmountain Salmon and Black Barracudas are among the food items with the highest prices, so look into those first. The generic TSM operation included should work very well for flipping food and fish. Pigments are used by Inscription. Both glyphs and darkmoon cards take a very large amount of pigments. This ensures that demand will be very uneven. I have not tested my hand much at this, but I have bought a lot of pigments to support my crafting and the price can be very variable. I suggest trying this using your own groups and smaller stack sizes. 20 should be good. You are completely dependent on getting your pigments substantially below market to make this work. I suggest setting the max price to 70% dbmarket to increase your safety. Ore is sold by farmers, both smaller and larger. It is mostly used by jewelcrafters mass prospecting. You will want to focus on selling at 100% dbmarket to ensure sales. Make your gold by finding ore that is cheaper than 70% dbmarket to ensure strong profits. The end items are not all consumable so this market is riskier than the ones above (but it can still be great). Enchanting materials are primarily crafted by enchanters shuffling. As these people mass craft the items supply is steady. I would therefore generally suggest being careful flipping Arkhana and Leylight Shards. Chaos Crystals are much harder to reliably craft on the other hand so they exhibit higher variability. They are used for enchants and obliterum and demand will spike on Raid reset day so make sure you are selling on Wednesday/Tuesday. I used to flip Leather and Clot, but the market has turned very bad on my realm. Most of the farmers post in stacks of 200 and undercutting is fierce. Your mileage will obviously vary. Your best bet is to sell to people who use the leather or cloth for the enchanting shuffle. This means you need to buy your items well below market value, as this process is usually very price sensitive. It is also the main driver of leather/cloth prices. If you are new to TSM and want to learn how to create operations I suggest checking out this guide by Bregvids. Material flipping is a market where you will have to change stuff as you gain experience, so some TSM knowledge will be extremely useful.